I figured I've done enough projects around here the last year and a half or so... so how about an update on some things?! Last April I made some homemade laundry soap. I have just now run out this month!! Crazy how that 5 gallon bucket (which doubles to 10 gallons once placed in a container) stretched so far! Now I will occasionally grab some store bought laundry detergent for a change of things. When Tide PODS were released there were a few sales I couldn't resist. I have also been stocking up on free and clear detergent for when baby gets here (for her cloth diapers). I do about 3 loads a week and if I exclusively used the homemade stuff it would have probably lasted 5-6 months. Still not bad considering the cost breakdown. 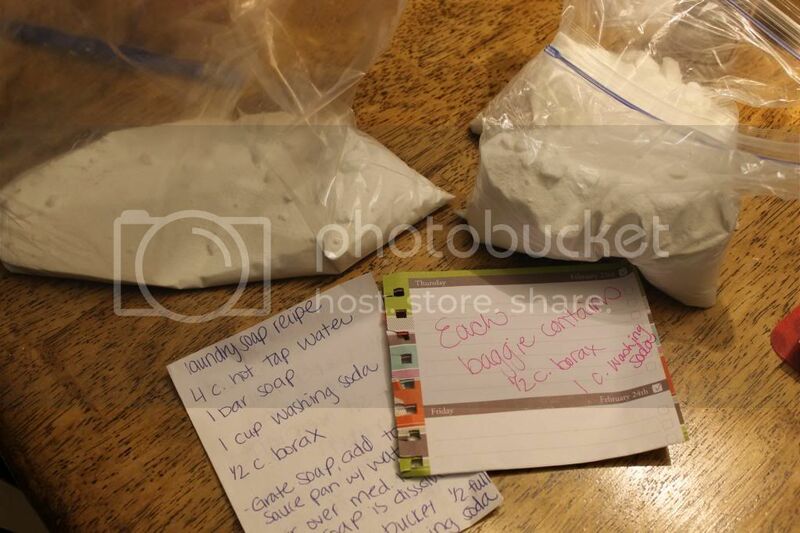 After I made the first batch in April, I had leftover borax and washing soda. To make subsequent batches easier, I pre-measured 1/2 cup borax and 1 cup of washing soda in little baggies. The boxes of washing soda and borax were a pain to store and they were over 3/4 gone. 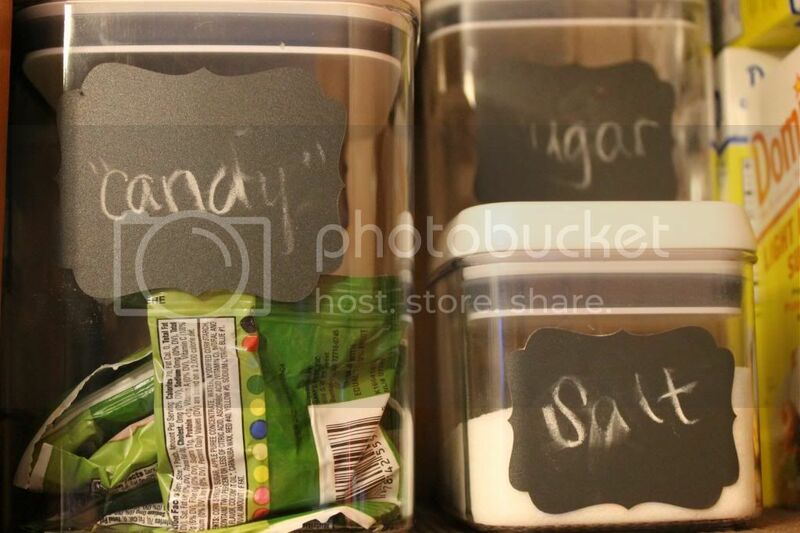 I even shocked myself by labeling what was in each bag and leaving the recipe in the bag! Only problem? The gallon size bag with the mystery white substance! I knew it had to either be borax or washing soda- but I had no idea which one. After a quick poll on Facebook a few friends said that washing soda will fizz with vinegar and borax will not! That's the quick chemistry class of the day :) So washing soda it was! I made sure to label that bag for next time. By the way I still have enough borax, washing soda, and soap to make 2 more batches! Yippe! Also while we're on the subject of laundry soap- we recently upgraded our washer/dryer to an HE top loader. Instead of filling the chamber to the brim, I only fill it about half way. I would say with my old washer I put about a cup in. With these newbies, it's about half a cup. It's super strange not choosing the water level on the new washer! It senses how much water it needs and adjusts accordingly. So less water=less soap. On to our chalk labels I blogged about here. We are still totally in L.O.V.E with these. This picture was just now taken (to show how they are holding up). By the way- if you want to see what we did before these amazing containers, head here. Of course I do write with chalk. Real, old school chalk. So sometimes it rubs off. But it's so easy to rewrite it really isn't any big deal. Also I have washed many of these containers numerous times. I do have to hand wash because I don't think the labels would fare well in the dishwasher. But again this is no big deal! Love our uniform containers! 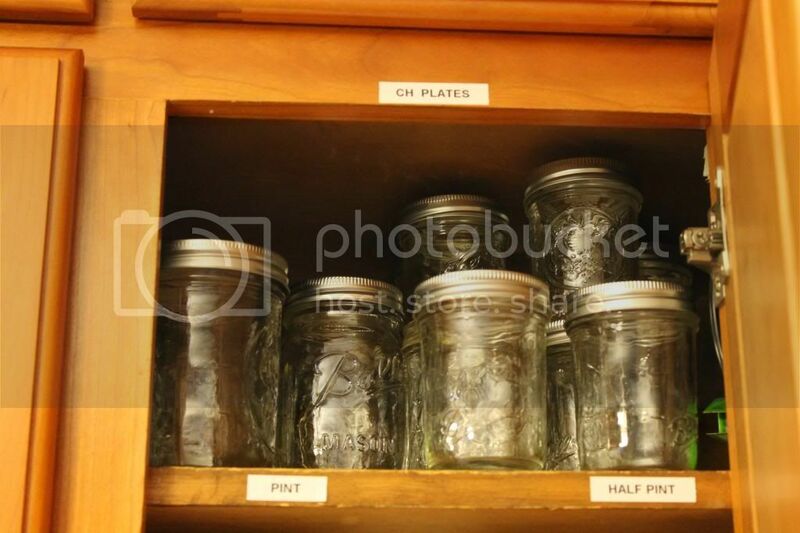 The mason jars are on the top shelf of the lower cabinet. I can reach the handle to open this cabinet. The "CH PLATES" label is telling me that our Christmas Plates are in the VERY top cabinet that I can't reach. That way instead of pulling a chair or step stool out and going through all 22 (yes 22 upper cabinets) I know exactly where to go. 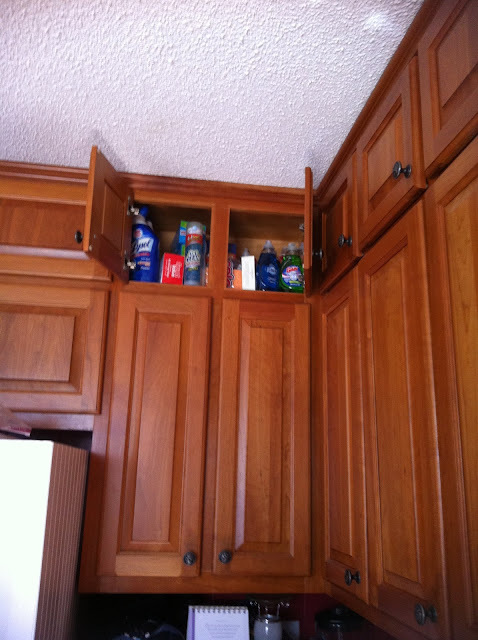 Here is an idea of how high the upper cabinets really are. As long as stuff stays where the label says, it has made life so much easier. 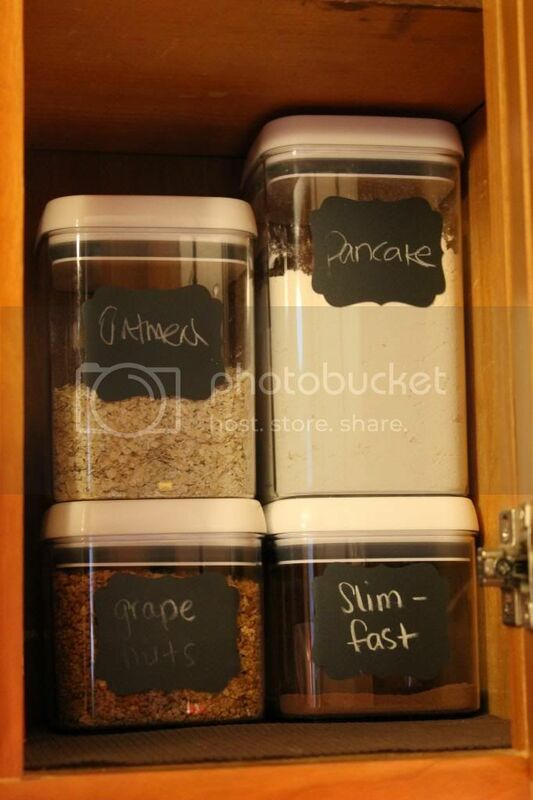 Also the labels are hidden once the cabinet is closed. Win-win! It's hard to believe we were in the middle of our master bath reno a year ago this month! You can see parts 1,2,3,4,5. But the thing I was most worried about holding up was the vanity (part 1). 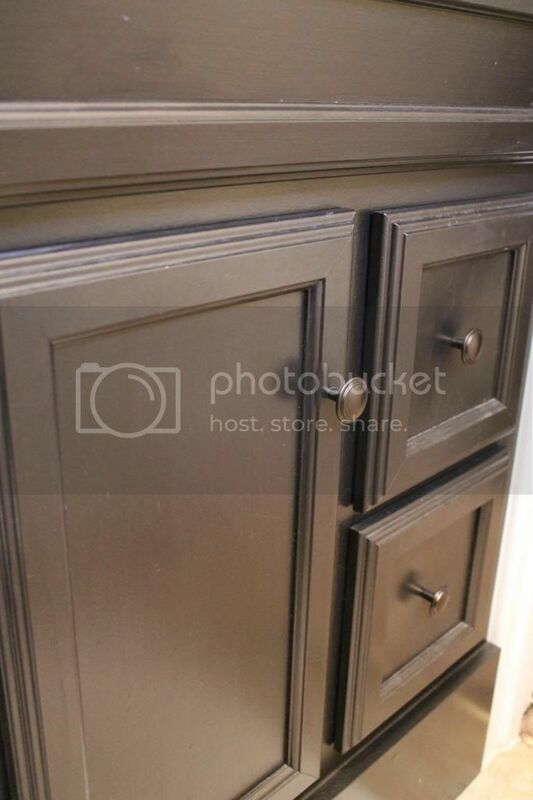 If you remember we painted over the "builders grade" oak vanity and made it more of an espresso color. There was a base coat that was dark chocolate brown and then a oil rubbed bronze glaze that I rubbed over the paint to give it more dimension. I am super happy to report that it has held up WONDERFULLY! There are no nicks in the paint, and I have had to scrub general bathroom grime off it (tooth paste splatters, hair spray over spray) and it does fantastic! So glad we made the call to paint it! 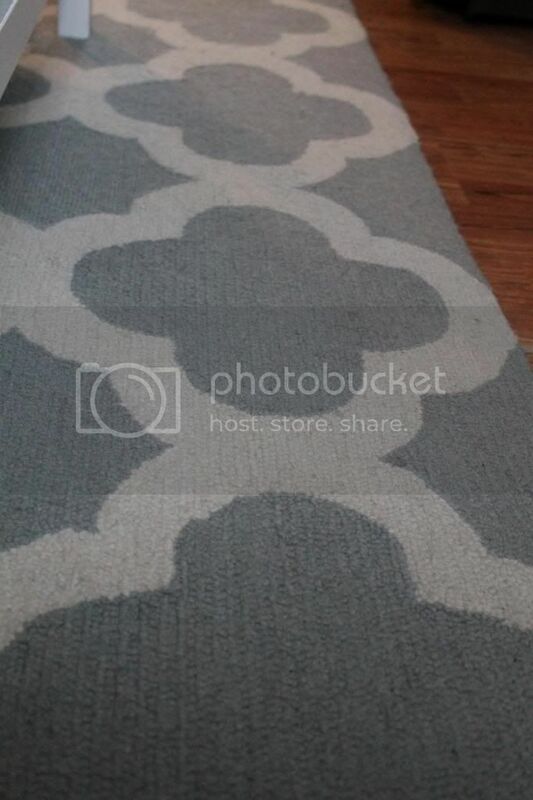 I get asked alot where we purchased our living room rug and if we still love it. I did a post about it here, and it's from rugsusa.com. YES we still love it. I may love it more than Josh- but that's beside the point. Besides having phenomenal service (the rug was back ordered set to arrive the last week of June, but we got it the first of the month- almost 3 weeks early), the color has stayed true to the original. It went through it's shedding phase like all new rugs, and I still feel like it sheds (that's what drives Josh crazy). Also the weave is a loop and sometimes when Sadie's nails are too long she'll pull up the loops. Oh well. But regardless I still love it! Also we used Scotchgard on it here which is helping to protect it from the inevitable toddler spills. Here it is today! I started by clearing everything out. It's the only way to go! I grabbed a couple baskets at Dollar Tree. The long skinny basket came 3 for $1 and the square baskets were 3 for $1. The pink one I had laying around. 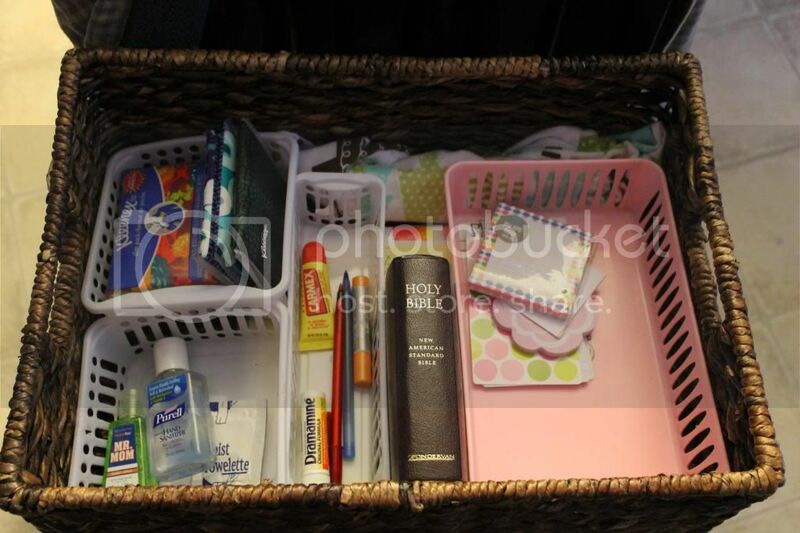 I broke everything up into categories (hand sanitizer, kleenex, post-its, chapstick) and put it all away. I did have a mason jar (filled with Luke quotes) that found another home, and the tripod that was the most awkward part found a new home as well. This is kind of my purse dumping ground and refill station. 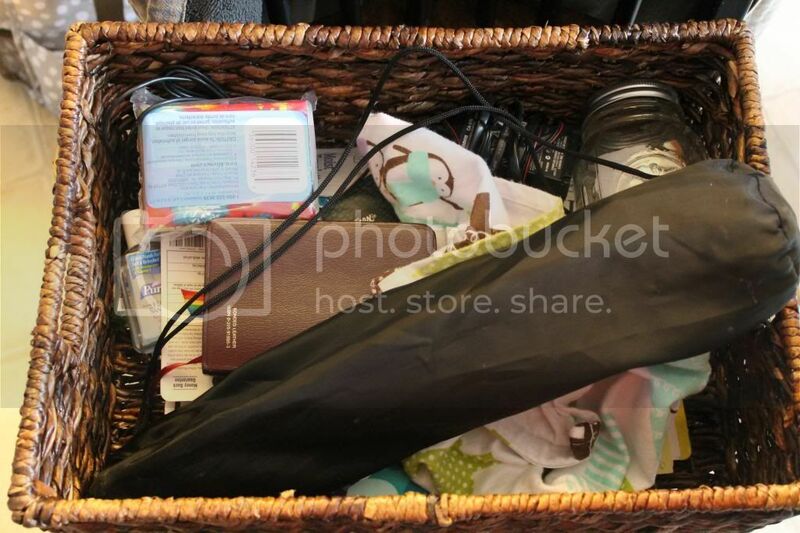 Eventually I would love to vinyl the bottom of each basket designating it to whatever it's holding. I want to make sure this works first though! It's already super pleasing to the eye! Also I'd love to do a similar update about how "going green" has been. I made cloth paper towels, we made the switch to cloth diapers and plan to cloth diaper new baby girl, we use cloth wipes on Luke and all our cleaning supplies (minus toilet cleaner) are homemade. I'll let you know how it's been working out! It's so nice to see an update post!! 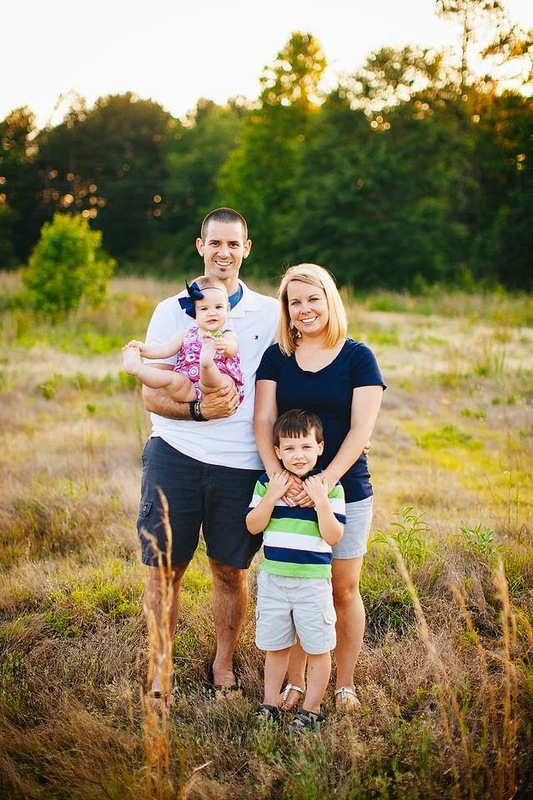 I just found your blog and so glad I did.